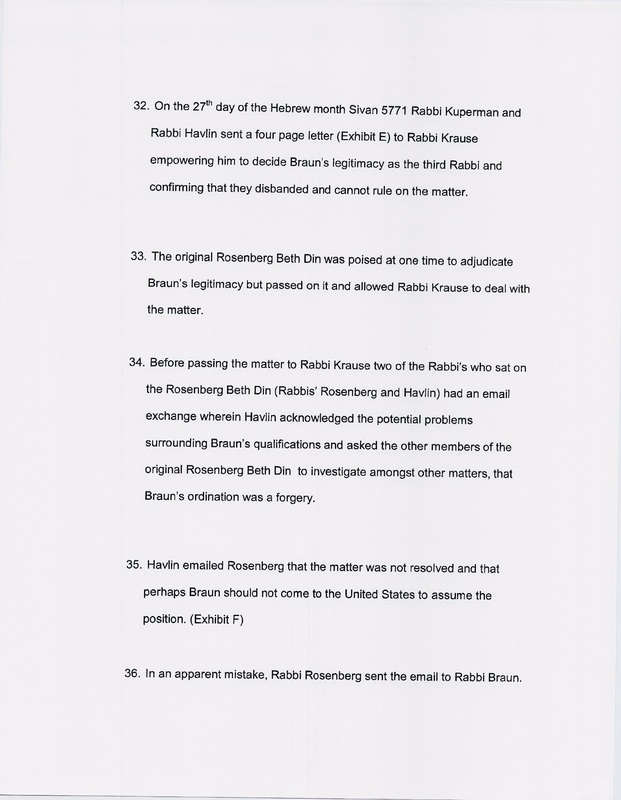 Judge Rothenberg's Court Order of June 29, 2012. 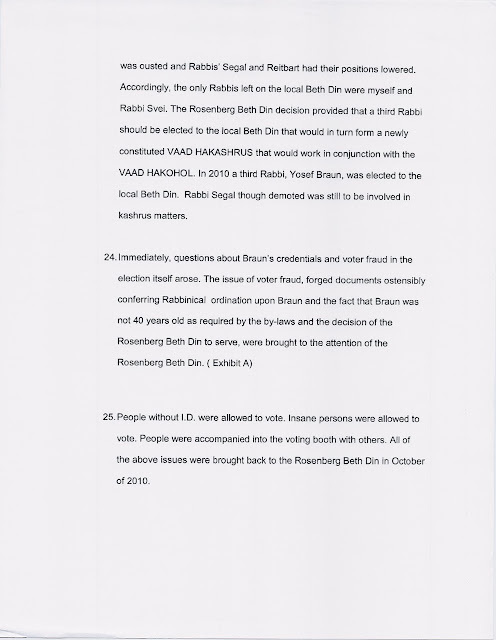 She confirmed the Rosenberg Beis Din findings, including the Psak Din concerning the validity of Rabbi Braun's election and credentials. 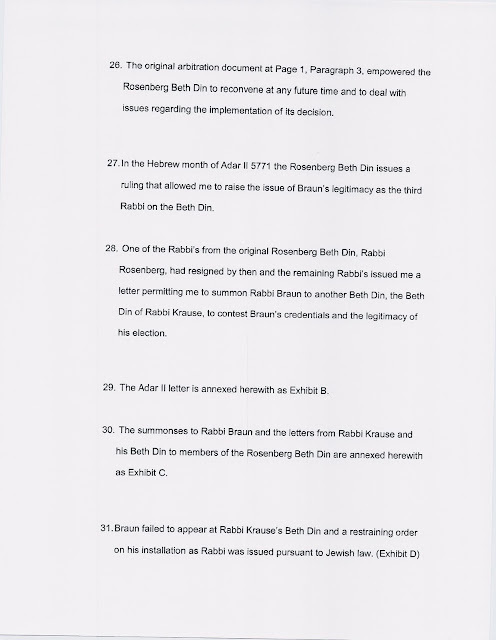 Since there were some issues about Kashrus that she did not feel were clearly spelled out in the Psak Din, she sent the parties back to the Rosenberg Beis Din for clarification before she issues a court order to confirm the Rosenberg findings in Court. 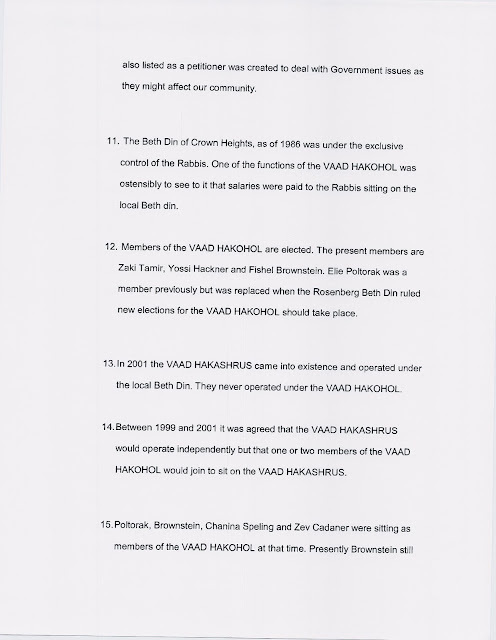 "The Beth Din Panel that issued the awards herein shall convene and the parties shall appear before it in further proceedings pursuant to this Court's prior order within 30 days (or a later date stipulated by the parties within 30 days). 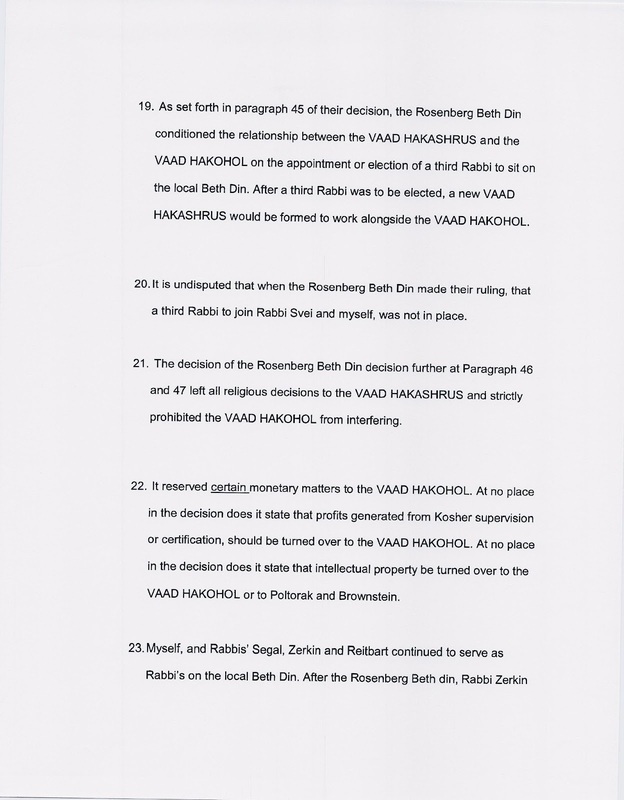 Failure to do so shall result in granting of Petitioner's amended petition, and entry of the Beth Din's two prior Awards as judgments of the Court, upon an application by a party." 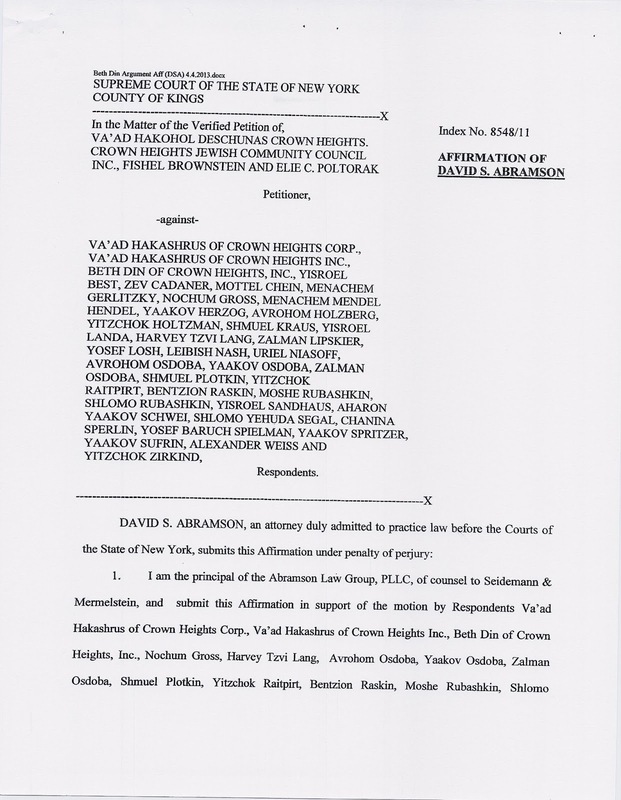 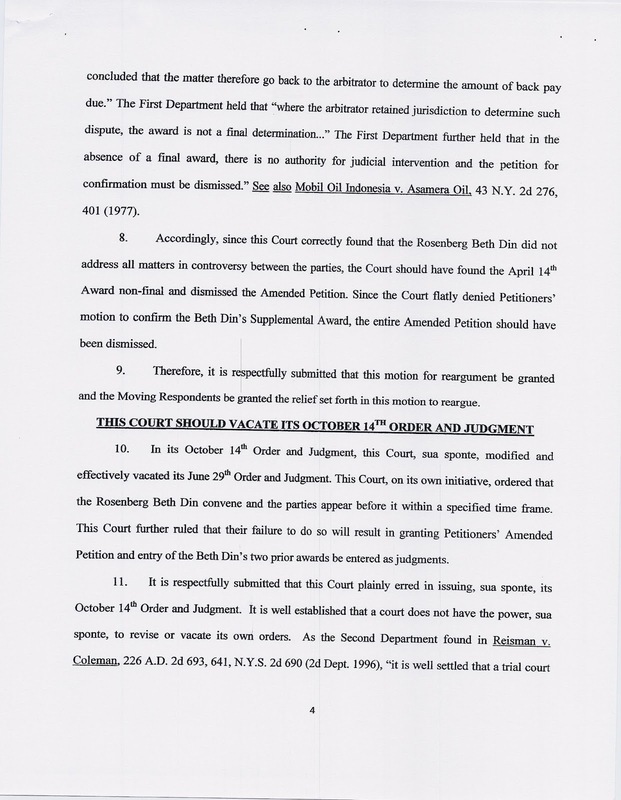 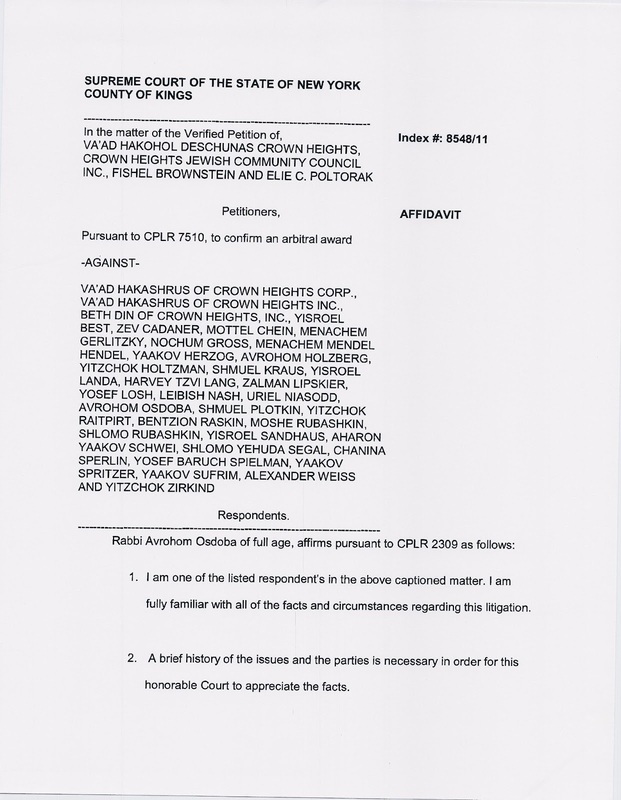 Abramson's (Rabbi Osdoba's lawyer) Opposition to Judge's Order (April 4 2013). 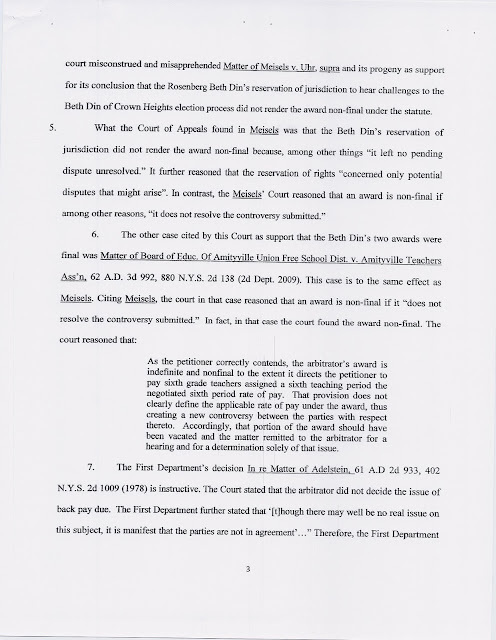 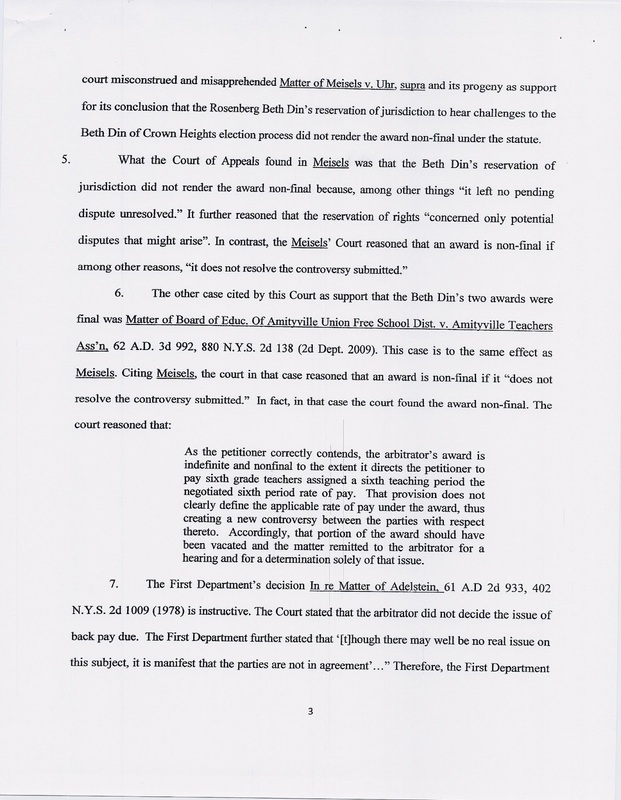 This motion asks to cancel the Judge's June 29, 2012 order that the Rosenberg findings are valid and asks to reargue this issue in another Court date. It also asks to cancel the Judge's October 14, 2012 order that the parties have to appear before the Rosenberg Beis Din, and that the Beis Din's finding will be recorded as a Judgment in Court if they do not. 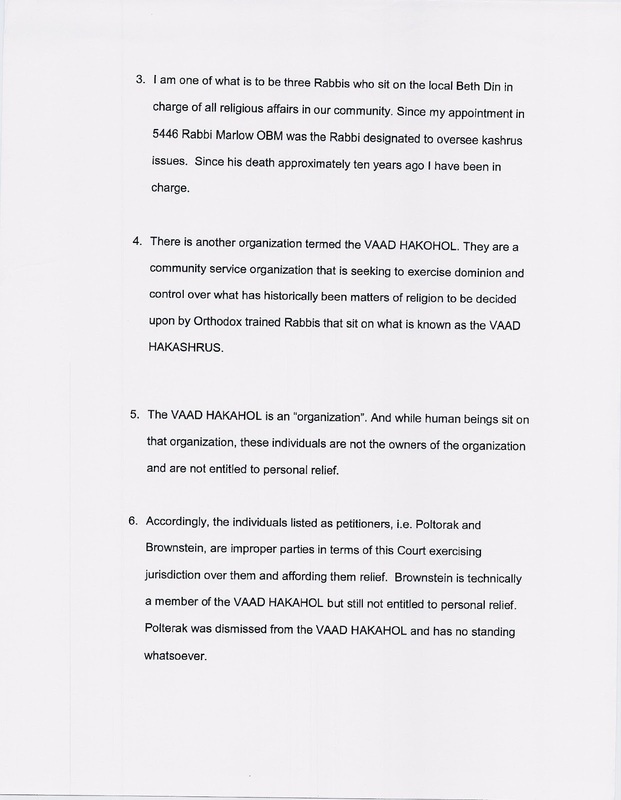 Rabbi Osdoba's Affadavit in Opposition to Judge's Order. 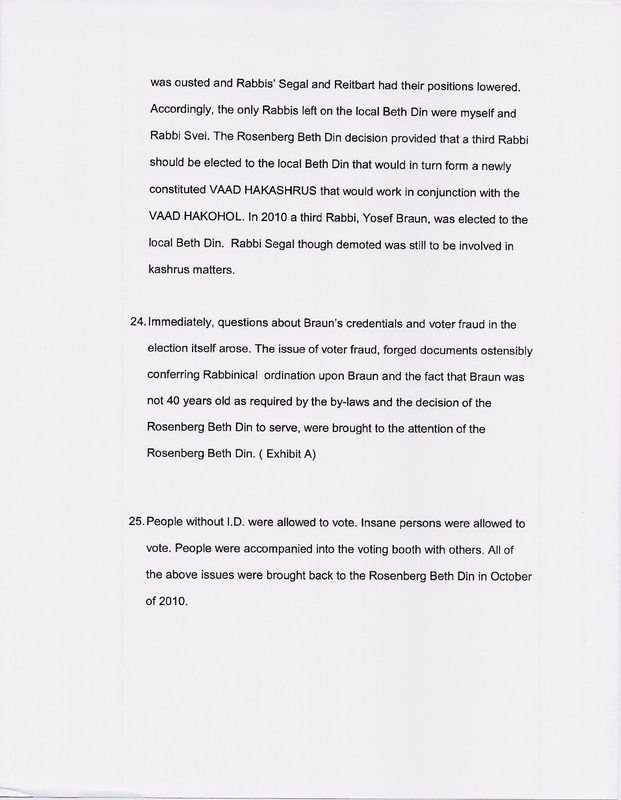 The affidavit says that the Rosenberg Beis Din's findings are not valid because they do not take effect unless a third Rabbi is elected to the Beis Din. 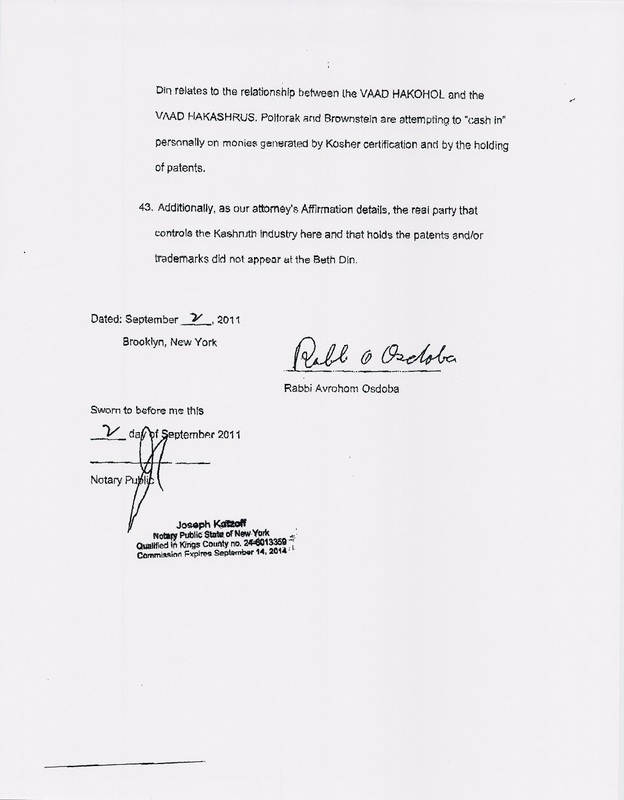 [No reason is given for this idea.] 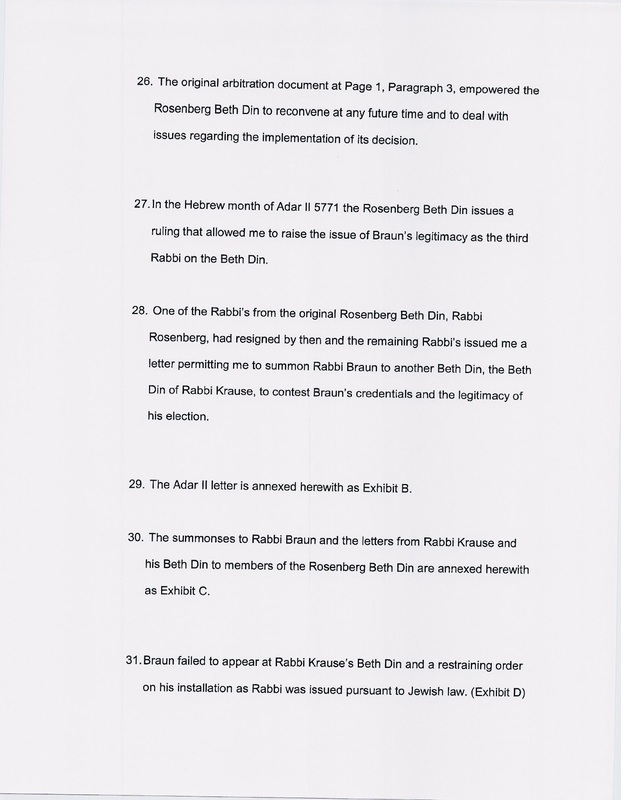 It also says that there are questions about Rabbi Braun's election and qualifications. 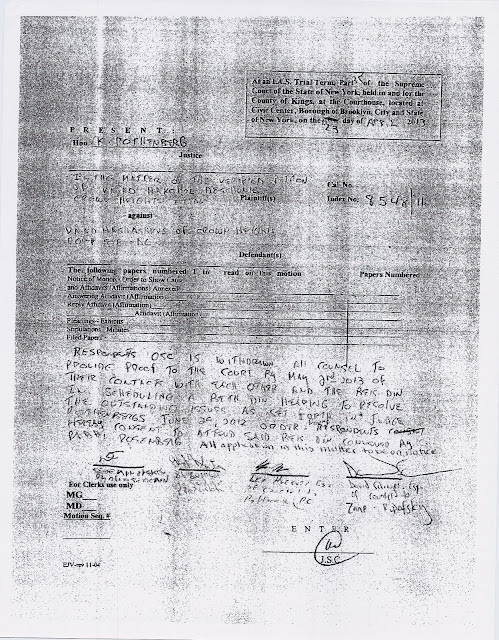 It furthermore says that Rabbi Rosenberg resigned and the other remaining members of the Beis Din Zabla gave permission to go to Rabbi Krause's Beis Din, and that Rabbi Braun did not respond to the summons from Rabbi Krause; he was therefore prohibited by the Krause Beis Din from joining the Crown Heights Beis Din. 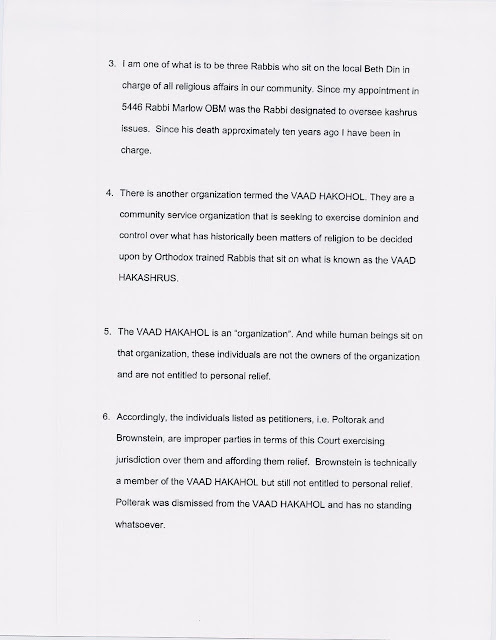 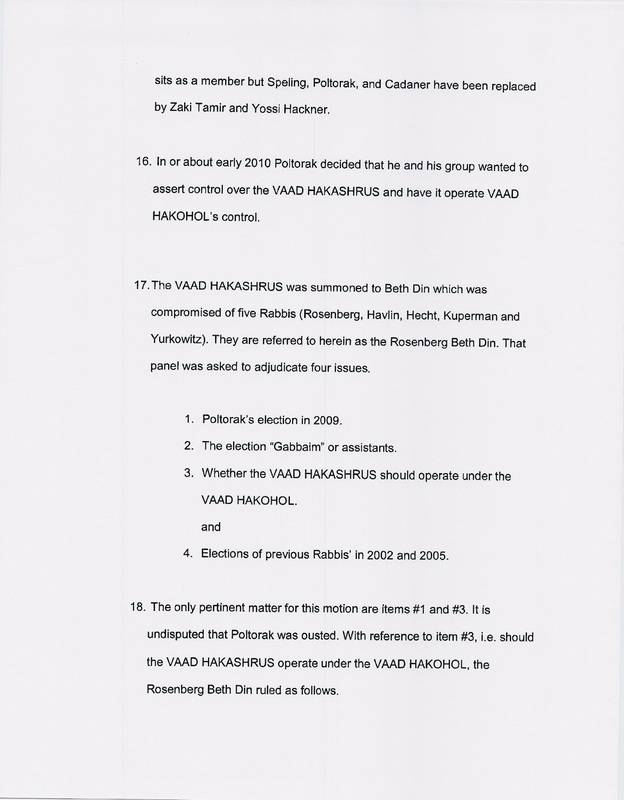 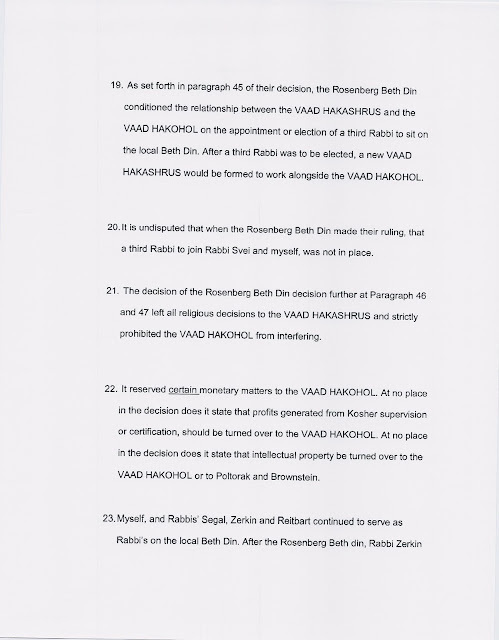 Finally, since the Rosenberg Beis Din findings are not valid without the third Rav, kashrus should remain under the control of the Vaad HaKashrus, and not be given over to the Vaad HaKohol. 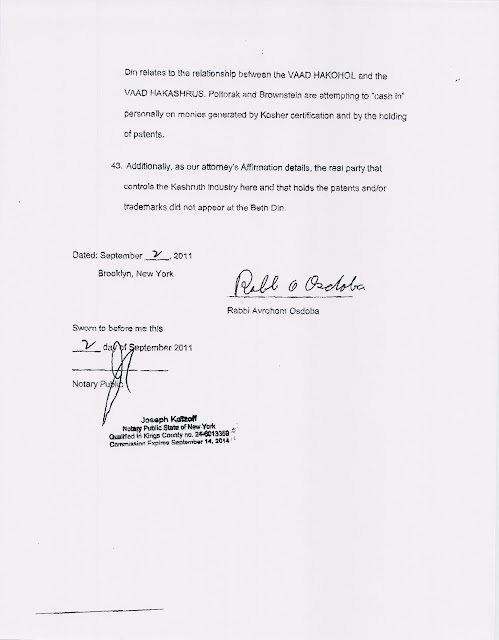 This is all signed by Rabbi Osdoba. 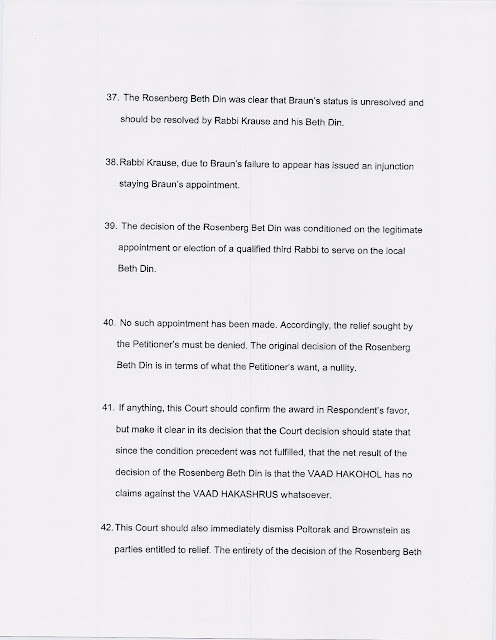 "Respondent's OSC is withdrawn. 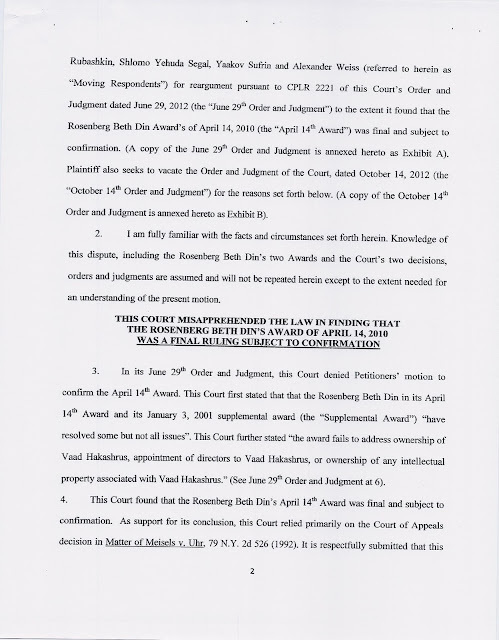 All respondents to provide proof to the Court by May 2nd, 2013 of their contacts with each other and the Beis Din in scheduling a Beth Din hearing to resolve the outstanding issues as set forth in Judge Rothenberg's June 29, 2012 order. 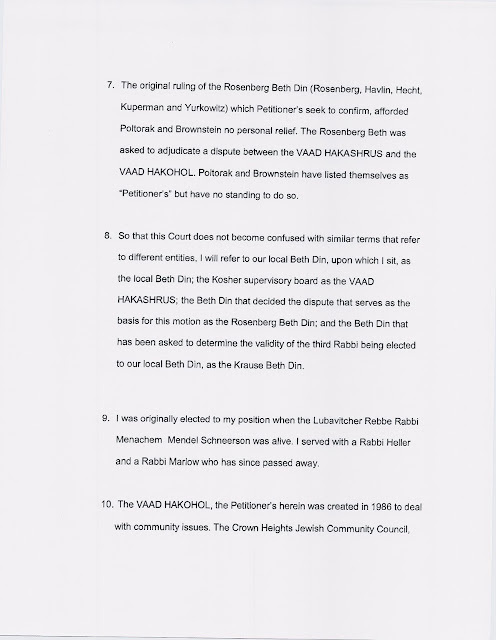 Respondents hereby consent to attend said Beis Din convened by Rabbi Rosenberg. 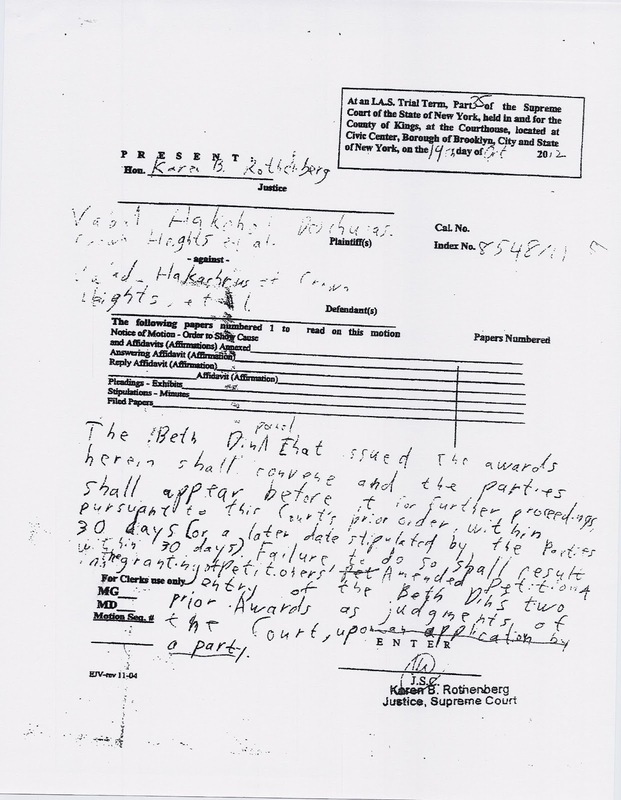 All application in this matter to be on notice."